Consider that you are just trying to replace your old phone but now you want something really good for just under 5000 rupees. You have come to the right place because today we are going to list the best top 5 mobile phones in the market which will cost you a lot less than expected. 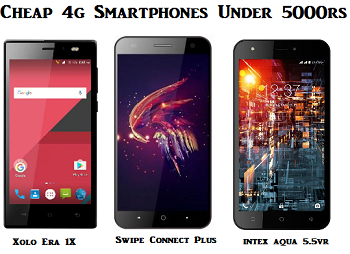 The phones we are talking about here are absolutely good smartphones but are not built with high-end specifications. These phones are absolutely value for money with ideal specifications like 2 GB RAM and even 4G VoLTE connectivity. Also you can expect the processor to be a quad-core chipset which is absolutely a must for any phone. You can use Jio sim Easily with these cheap smartphones and Benefits by Reliance Jio. Swipe is again an Indian brand phone which has really good specifications on paper and performs up to the mark. It runs on Android lollipop 5.1 freedom OS on top. The phone packs and amazing 2 GB of RAM with 16 GB of internal storage which is by far the highest on this list. The phone is also accompanied with a 13 megapixels’ rear camera and 5 megapixel selfie camera. Overall the phone has really great performances with a 3000 mAH battery which can easily last for a day. This is the latest Budget smartphones from Xolo and it is the best phone under 5000.The features are extremely amazing with a 5 inch 720 p HD display. The screen quality is amazing at the price. The mobile runs on 1.3 gHz Spreadtrum quad Core processor. With 1 GB of RAM and 8GB of internal storage with an additional expandable storage up to 32GB this phone can run smoothly on multitasking. The camera of 8 megapixel real and 4p largan lens are a great add on. Another great addition to the list of budget smartphones is Yunique which comes with an Android lollipop 5.1. It has amazing features like a 720 p HD display with Corning Gorilla Glass protection and 8mp camera. The 4.7 inch device is also loaded with 2000 mAH battery. The key features include dual sim support with 4G LTE, 3G and 2G. Minimal features such as 3.5 mm jack, Wifi and Bluetooth are also provided by default. Intex is a well-known in and which is quite affordable and suitable in a budget smartphone range. The latest addition to Intex is Intex Aqua 5.5 VR (4G VoLTE). The phone is powered by a 1.3 Ghz MediaTek 62 bit quad Core processor. It runs on the Android Marshmallow 6.2 which provides decent performance for day to day usage. The other specifications include 1 GB of RAM 8 GB of internal storage and expandable memory up to 32GB. Boot front and back camera are fitted with 5 megapixel lenses which makes it an apt smart selfie phone. It has an impressive battery of 2800 mAH. 5. The first on our list is Android one. This is Google's own product which was released just a few months back. The aim of this program was to make good affordable smartphones with will run with the latest updates. These Android one smartphones have an awesome 4.5 inch LCD display combined with 1 GB of RAM and 4 GB of built-in internal storage memory. Currently Spice dream Uno and Micromax Canvas a1 are some of the phones sporting this list. Do give these phones a try and let us know your comments.